Observations of 2006 March 29 total solar eclipse in Karachai-Cherkesia. The 200 km wide shadow of the total eclipse went from Turkey, crossed Black Sea and Abhazia, and its centrum passed near the highest Caucasus mountain Elbrus. So it covered south-eastern half of Karachai-Cherkesian Republic of Russia. The Special Astrophysical Observatory was located at the edge of the shadow, and a single interior contact was seen from the upper observational site at the 6-m telescope BTA. We have rented a bus and have a journey to mountain-pass on the road from Karachaevsk to Kislovodsk with a small group of astronomers, their guests and relatives. Duration of total phase at the site of observation was of about 2.3 minutes. There were some low cumulous clouds over the mountain-pass, and therefore we had to return back to canion. We took place just on the roadside, and prepared for observations. Some small clouds might interfere the observations but they were so low that one could leave their shadows. As became colder, they melt rapidly away. We used digital camera Fuji FinePixel to take photos. Map of Karachai-Cherkesia showing the site of observation. In the total phase of the eclipse the sky was blue, and we did not see any stars in the sky. The landscape was illuminated by a strange purple light, that we suggested the radiation of solar chromosphere. This light was stronger in the beginning and in the end and weaker in the middle of totality. We did not see any peculiar behaviour of animals. Cows were going by with a cool quietness. But not the people. Just in the total phase, a car with inhabitants stopped nearby, and they run up to us. They were very afraid and asked "What is this? When will this end?" We said that in one and half minutes and give them look in the optical tube. They got to know that we came especially to observe the eclipse and relax. A minute before the total phase. Red hexagon is a flash of camera optics. Few seconds before the total phase. Beginning of the total phase. Wide-field view of totally eclipsed Sun. 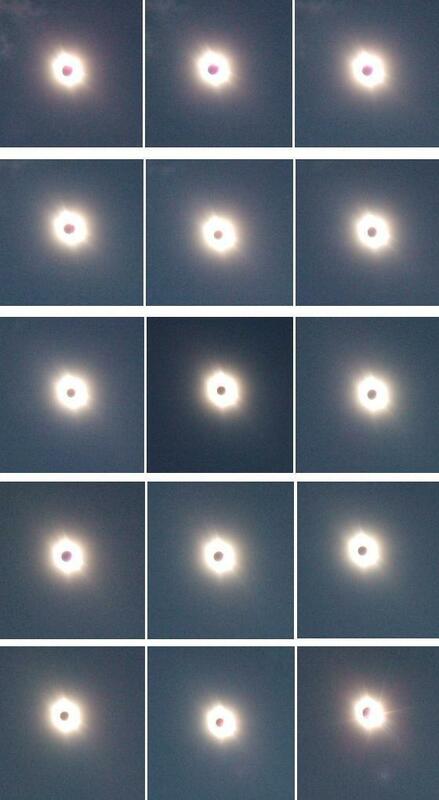 All successful photos taken in the phase of totality. Barsukova, E.A. Special Astrophysical Observatory.